Grammar. The word can bring back unpleasant memories of your middle school English teacher. And where you work, there is likely at least one communications professional whose job it is to edit customer-facing content. But in 2016, people in every industry find themselves writing content without sending it to someone else first—whether it’s for a tweet, a blog or a conference presentation. Here is a quick refresher on common grammar mistakes, to help you sound like the polished professional you are. Which and that. How you use these depends on the sentence structure. Which is for saying something about your subject that isn’t crucial to the main message of the sentence. For example, “Paint recycling, which is catching on in the D.C. area, will be easier next month with the arrival of a paint collection location.” That is for restricting the meaning to a particular category: “Paint cans that are empty go into this bin.” For a more thorough explanation, check out Grammar Girl’s post on the subject. Grammar Girl: Mignon Fogarty’s “Quick and Dirty Tips for Better Writing” answer typical questions about all things grammar and usage. She also has a regular podcast. The Elements of Style: Strunk and White’s classic book has been helping writers with their craft since 1920. Its humorous tone and brevity make it a surprisingly engaging read. The Oatmeal has some hilarious cartoons illustrating grammar concepts. Try this one on the proper use of apostrophes. 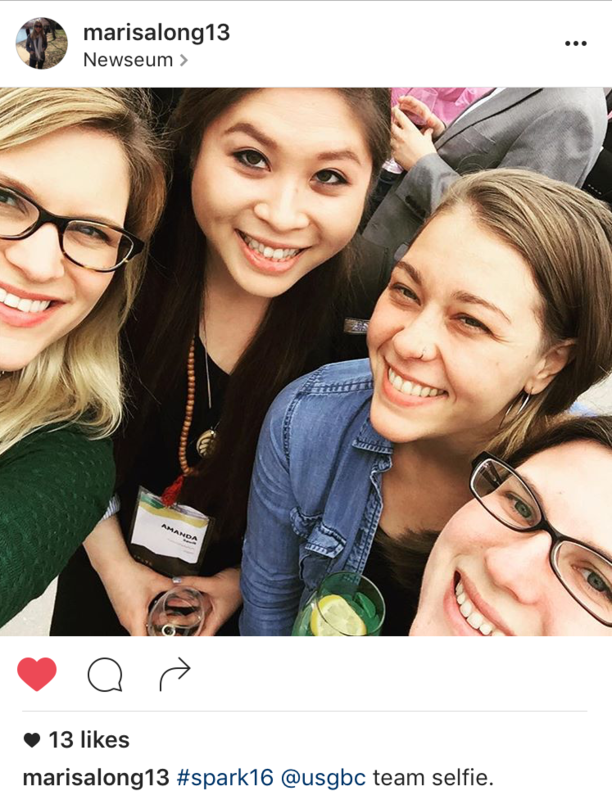 Last week, members of USGBC’s public relations team attended a content marketing conference in Washington, D.C. The second annual Spark 2016 by TrackMaven did not disappoint. Incredible keynotes included Brandon Stanton, of the popular Humans of New York; Shane Snow, from Contently; Stephanie Hay, from Capital One, and of course, TrackMaven CEO Allen Gannett. I first learned about TrackMaven when I attended Spark last year. As an all-in-one marketing analytics platform, their mission is simple: to “make marketers more effective through data that is understandable and actionable.” TrackMaven has given our organization tools to first understand our data and turn those numbers into a visual narrative that conveys the USGBC brands’ social media progress and patterns. The Spark conference reiterates the mission of TrackMaven by ultimately creating a celebration of content and data in digital, highlighting the many intersections in marketing where art and science meet. Our team is diverse; so, in addition to my own insight, I wanted each of them to weigh in on the experiences that were most impactful to them during the one-day conference. Know where, when and how to reach your audience. Answering the question, “What do they want to hear from us?” can vary depending on your audience demographics, location, platform usage and consumption rates. Much of the challenge in audience targeting lies in the fact that many people are multi-channel, and have different habits and usage times for each. On top of that, each channel has a different a user experience. The most successful content is optimized for the particular platform through which it is distributed—right down to the message. Tap into a larger, humanistic perspective. Digital overload isn’t necessarily a digital problem, and doesn’t strictly require a digital solution (although you do want to optimize content for various digital platforms). Generating interest hinges on how people relate to your content—the more your message resonates on a personal level, the better. Consider broadening your target audience to anyone who has the challenge or problem that your organization exists to solve. Define the challenge in a bigger context and use their native language (i.e., the words they use to talk about the problem) to drive your content strategy. Let your brand be the background of the story. In an age where content is everywhere, stop trying to become the story that interrupts what your audience is doing and turns their attention away from the ongoing happenings of their lives. Instead, become part of that flow and let your brand support an engagement strategy that meets people where they are. For instance, if you are marketing a restaurant or food item, connect with your consumers around all of the reasons they interact with food—family, friends, nourishment, escape, travel and more. Become a part of existing conversations or stories around these themes, and let your brand play second fiddle. Become a student of humanity. Above all, seek to understand before you strive to be understood. To reach people, you need to dig deep into their motivations and journeys. Read up on psychology, sociology, anthropology and more—look for trends in behaviors and interactions, and work toward a deeper and more meaningful understanding of your target audience as humans with multiple interests and drivers. Manage your priorities, not your time. On hectic days when it seems like there aren’t enough hours to go around, organize your workload by priorities and balance your time based on what is most important. This approach will give you the freedom to put “urgent” matters that are not a priority to the side in favor of advancing or completing work that will drive your team or your business forward. Leverage your key audiences. USGBC is committed to engaging our audiences and telling their stories. Including your stakeholders at the beginning of a campaign or as part of a pitch, collateral, article, report, etc., will make them more committed to sharing what you are hoping to communicate and amplify your message to a much wider-reaching audience while building additional credibility for your brand. There is power in working together. Experiment with headline testing. Your online content should engage your audiences. You can choose one platform to leverage social media advertising to test different headlines and messages to see what resonates, and then amplify the headlines that perform better on the rest of your channels. This practice is an inexpensive but powerful way to make sure you are giving your readers the content they want. Know your worth. With media, you should only be pitching content that you really believe is worthy of coverage and pitching it to the right reporters. If you are doing this, it is a misconception to think that the reporter is always doing you/your organization the favor by covering it. If you have a powerful story to tell and can provide thoughtful, specific and detailed information and examples, you are helping the reporter and providing their readers with something of interest to them. Make the “conversation” a priority. Engagement is all about the two-way dialogue. Even on the days where I’m inundated with content for promotion, it’s pivotal to always be connecting the appropriate people with messaging that provokes conversation. A retweet is great, but think multiple steps into the future: How do I want people to interact with this content? What kind of conversations would I like to see it drive? On what page do I ultimately want to see the audience end up browsing? A conversation around “audience goals” should be had at the conception of an idea. Every post should have its own identity, its own journey, in this way. Know when to pay to play. Know when it’s worth the paid promotion of content. Often, competitors are only beating you in the game because they’ve paid to boost posts. Additionally, do the research to attract a well-targeted audience. It’s not worth the cost if you aren’t doing your due diligence in captivating the attention of new audiences and relevant competitor audiences. Take risks. In a constantly changing digital medium, most moves are chance. Don’t be afraid to experiment—there are no failures, just learning experiences. The data will report our successes and shortcomings, and we will adjust our goals and our planning boards accordingly. For just a taste of what went down at Spark, presentation slide decks are now available. A writing mentor of mine once remarked that writing for the web is like composing a poem—you’re trying to convey as much as possible within the short space of a few words and sentences. Research shows that people read differently on the internet. Their attention spans are shorter, they tend to scan and they make decisions within the blink of an eye on whether to stay on a website. Visitors leave a page within the first 10-20 seconds of clicking (Nielson Normal Group). If they stay, they’ll read at most 28 percent of the words on the page (Nielson Normal Group). They’ll judge a website within 50 milliseconds based on its design (International Weekly Journal of Science, Carleton University). 1) Stick the important information at the beginning. Cliffhangers are great for the movies, but it’s best to get to the point when it comes to your web content. Since the typical user only stays on a page for seconds, answer the most basic questions—who, what, where, when, why and how—right out of the gate. Then, explain why your content matters, following that with supporting evidence and background information. In the mood to learn some marketing lingo? This style of writing is called the Inverted Pyramid, in which you prioritize information by descending order of importance. 2) Use signposts and bullets. Big blocks of text can be off-putting for online readers, who typically skim rather than read everything on the page. (Slate has an excellent article poking fun at how we read on the web that’s also informative). Use subheaders to break up text and organize your information. For lists, consider using bulleted points so the content is easier to scan. Keep the language simple in your online copy. Using that dollar-sized word might have been great on your SATs, but when it comes to online copy, they’re a pain. Jargon by nature is exclusive, and those online readers who aren’t immediately aware of your industry’s terms will seek other information that’s easier to understand. From a language standpoint, the words “that” and “just” often are ones you can eliminate from copy, along with adjectives, adverbs and prepositions. Provide supporting evidence for your online copy by linking to current, relevant and authoritative voices on the subject matter. Just be sure to not go overboard with the links; add them where they make sense.